NEW BRITAIN - No matter how hard the Windsor baseball team tried, it couldn’t muster anything against William Homar. A no-no would be the more accurate way to describe it. New Britain’s ace threw a no-hit, complete game to lead the Hurricanes to a 3-0 win Friday afternoon, the team’s second in a row. Windsor had been unbeaten coming into the day. The head coach wasn’t wrong. Homar struck out just two hitters, but allowed the players behind him to make plays in the field. At the plate, the Hurricanes scored three runs over the third, fourth and fifth innings and it was all the offense they needed. The New Britain High School team will be going to New Britain Little League tomorrow at 11 a.m. at Stanley Quarter Park. Berlin 7, Middletown 6: When his team needed him to come through and deliver, Nick Carroll did just that. The Redcoats senior drove in the winning run in the bottom of the seventh to help Berlin beat the Blue Dragons. It was part of a 3-for-4, three-RBI afternoon for Carroll. Ryan Hyde also went 3-for 4 while Cam Murphy picked up the win. 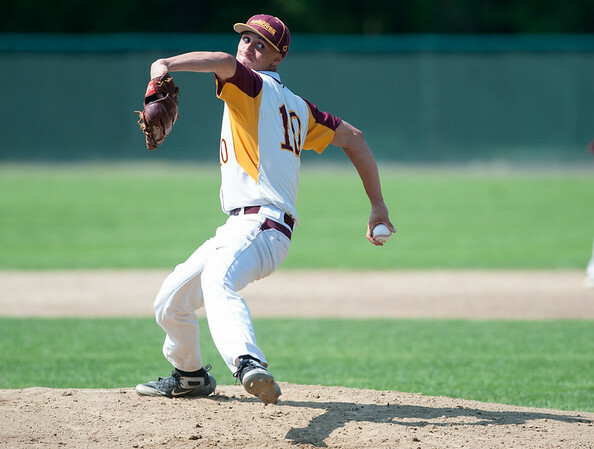 Newington 12, Hartford Public 1: Joey Zawisza continues to deliver on the mound for the Indians, while his offense keeps on churning out runs. The senior pitcher struck out five over eight innings and allowed just two hits and a run to the Owls as the Newington earned its fifth straight win. Gunnar Johnson went 2-for-2 with a double, three RBI and three runs score for Newington, while teammate Eathan Errera went 1-for-2 for two with a double, four runs and two walks. Goodwin Tech 10, Vinal Tech 8: Matt Anderson had three hits and Paul prior drove in four runs on three hits himself for the Gladiators, who found themselves in a slugfest Friday afternoon. Chris Ryan earned the win for Goodwin Tech and struck out five. Andrew Paradis hit a double for Southington, which scored its lone run in the fourth. Southington is now 3-4 on the season. Newington 31, Hartford Public 4: It was a successful day on the mound for Newington’s Dani Pantano. The sophomore pitched three innings and struck out nine, with no earned runs. McKenna DeLuca was also effective at the plate, going 4-for-4. Middletown 15, Berlin 0: It was just a five-inning game for the Redcoats who committed eight errors on the afternoon. East Hartford 3, Newington 1: The Newington boys volleyball team entered Friday a win shy of clinching a postseason berth. The Indians will have to continue to wait as they fell to the Hornets 3-1 (25-22, 25-27, 25-16, 25-23), suffering their first loss of the season. Leonel Caceres had 18 kill for Newington. Newington 6, Fitch 1: The Indians are now on a three-game winning streak. Newington’s Sean Davis defeated Matt Kirck 6-0, 6-2 to start of the singles matches. Matt Utter defeated Chris Russo 6-0, 6-0 and David Magsaylo defeated Max Carrier 7-5, 7-6, 7-1. The Indians only lost the No. 4 singles match. Lukas Klinn was defeated by the Falcons’ Aidan Sullivan 6-4, 6-1. As for doubles it was a clean sweep. Dan Lasota and Sam Johnson defeated Noah Kennedy and Andy Trinh 6-3, 6-1, Josh Ellis and Gynno Backoco defeated Nate Kowalski and Milan Pital. Ateeb Rhaman and Mike Zhai finished off the afternoon with a forfeit. Newington 7, Bloomfield 0: It was a clean sweep for the Indians. During the singles matches Olivia Rozio defeated Angela Davis 6-3, 6-3, Mara Klin defeated Jessica Delgato 6-3, 6-2, Emmy Petronio defeated Arya Perry 6-1,6-2 and Kelly Iskra defeated Crystal Thompson 6-3, 6-2. As for doubles, Elle Wronka and Melissa Riggins beat Tiffany Hurdle and Aryanna Spence 6-1, 6-0; Linsdey Weaver and Julia Mazur defeated Aleigha Gentry and Gina Johnson 6-1, 6-0 and Samantha Miller and Blayne Warnner-Hyde defeated Laila Powell and Jasmine Pennington 6-0, 6-0. Newington is now 2-2 on the season. Wethersfield 179, Plainville 281: The Blue Devils are still looking to collect their first win of the season. Wetherfield’s Leah Ayer was the medalist on the afternoon. Plainville was led by Kaylee Markavich who had a 65, Caitlin Charest with a 69, followed by Jessica Royce (70) and Heather Maier (77). Posted in New Britain Herald, Berlin, Goodwin Tech, New Britain, Newington, Plainville, Southington on Friday, 20 April 2018 21:11. Updated: Friday, 20 April 2018 21:13.